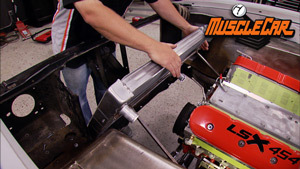 The Olds body goes onto the chassis, and the guys do some custom metal working on it as well. Flashback takes a look at a '69 Trans Am. (ANNOUNCER)>> TODAY ON MUSCLE CAR, INCH THEM UP, MOVE THEM OUT, GIDDY UP OLDSMOBILE. 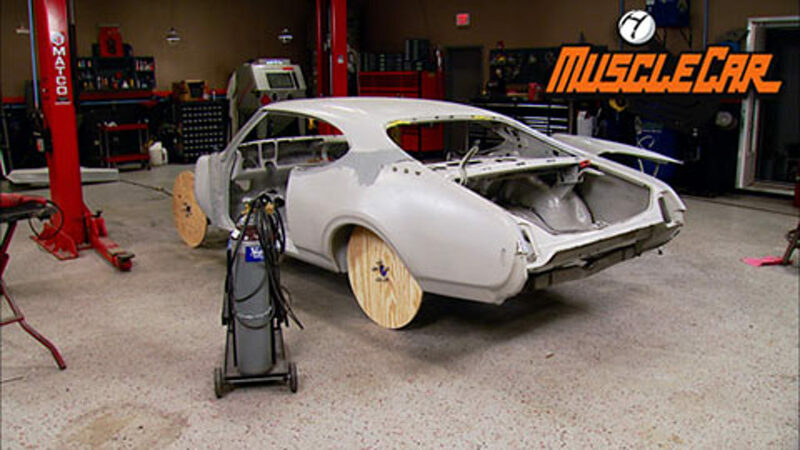 RICK AND TOMMY SET OUR HURST OLDS ON SOME MOCK UP WHEELS THAT YOU CAN MAKE ON THE CHEAP. THEN REMOVING DRIP RAILS, FLUSH MOUNTING GLASS, AND A CHERRY TRANS AM. AND HAD IT POWDER COATED IN PRIMER AND GOT THE BODY ALL SEALED UP. THEN WE FIXED SOME BUGGERED UP SPOTS ON THE QUARTERS. (RICK)>> THEN OUR GOOD BUDDY ART MORRISON STOPPED BY AND BROUGHT ALONG ONE OF THEIR STATE OF THE ART CHASSIS. NOW THIS IS GONNA GIVE US A ROCK SOLID FOUNDATION FOR OUR OLDS BUILD. AND IT'S GONNA HAVE TO BE ROCK SOLID CAUSE CHECK OUT WHAT'S GOING IN THE ENGINE COMPARTMENT, A NECK SNAPPING GM PERFORMANCE LSX 454. NOW WHEN THIS THING IS UP AND RUNNING, IT'S GONNA WORK THE HECK OUT OF THAT CHASSIS WITH OVER 600 HORSEPOWER. AND IT'S GONNA BE ABLE TO WITHSTAND ALL THE POWER THAT THAT LSX IS GONNA BE ABLE TO THROW AT IT. THESE NINE PLUS CASES THAT CURRIE MANUFACTURES ARE BUILT FROM THE GROUND UP. THERE ARE NO REMANED PARTS TO BE FOUND IN THEM, BUT THEY STILL PLUG RIGHT IN EVEN IF YOU FIND YOURSELF RUNNING AN OE OR STOCK STYLE HOUSING. WE'RE PLANNING ON RUNNING A SIX SPEED WITH THIS COMBO, AND WE OPTED FOR A SET OF 3.90 GEARS TO SPIN OUR TIRES. (RICK)>> WE'RE ABOUT KNEE DEEP IN THE MOCK UP MODE HERE, AND ONE OF THE HANG UPS CAN BE WHEEL AND TIRE SIZE, AND BY EXTENSION RIDE HEIGHT. NOW WE DO HAVE SOME PRETTY COOL PLANS FOR THE ROLLING STOCK ON OUR OLDS, BUT WE'RE NOT READY TO FILL YOU GUYS IN ON THAT YET. BUT WE STILL NEED TO GET OUR CHASSIS UP TO RIDE HEIGHT. THAT WAY WE CAN CHECK THINGS LIKE TIRE CLEARANCE, GROUND CLEARANCE, ALL THAT. (TOMMY)>> ONE WAY TO DO THIS BEFORE YOU HAVE YOUR REAL WHEELS AND TIRES IS TO MAKE THEM OUT OF WOOD. ALL YOU NEED IS SOME PLYWOOD, A SAW, A PIN, AND SOME STRING. GONNA BE 27 AND A HALF. SO I BROUGHT OUR MARK IN ABOUT 14 AND A QUARTER FROM EACH SIDE. THEN WE'LL COME BACK OUT TO 13 AND THREE QUARTER AND THEN MAKE OUR MARK. NOW I USE A PIECE OF CARDBOARD AND AN ORIGINAL CHEVY WHEEL. SET THE CARDBOARD IN FROM THE BACK AND JUST MARKED OUT WHERE THE HOLES ARE TO GET OUR BOLT PATTERN. QUICK AND EASY, AIN'T GOTTA OVER THINK IT. GOT TO GO IN THE MIDDLE. THAT CHOPPED OUT, THEN WE CAN TEST FIT OUR NEW HOOPS. ALRIGHT, LETS SEE IF IT FITS. THAT LOOKS HUGE. THAT TURNED OUT GOOD, NOW I'VE JUST TO MAKE THREE MORE. NOW I KNOW WHAT YOU GUYS ARE THINKING. IF WE WANTED TO RIDE DOWN THE OREGON TRAIL AND HUNT FOR BUFFALO OR SOMETHING, WE'RE ABOUT 160 YEARS TOO LATE. HEY MAN, IT'S ALL GOOD, ALL THESE BAD BOYS NEED IS TO BE ABLE TO HOLD UP OUR OLDS JUST LONG ENOUGH FOR US TO GET SOME REAL WHEELS MADE. BESIDES, THIS WAY TOMMY WON'T BE A RISK FOR A BAD CASE OF SCURVY. (TOMMY)>> NOW WE'RE PUTTING OUR BODY BUSHINGS IN PLACE. PUT THESE IN THE WRONG SPOT, CAUSE THEY COME IN DIFFERENT THICKNESSES, YOU'LL BEND THE BODY. (RICK)>> WE'RE GONNA USE ART MORRISON'S ALUMINUM BUSHINGS FOR NOW. LATER ON, IF WE WANT, WE CAN ALWAYS POKE IN SOME URETHANE ONES FOR A LITTLE COMFIER RIDE. THAT'S IT! (TOMMY)>> WELL IT LOOKS LIKE OUR WHEEL WELL IS PLENTY TALL ENOUGH FOR THE HEIGHT OF THE TIRE THAT WE'RE RUNNING. TO CROSS THAT BRIDGE WHEN WE GET THERE. THE CAR IS SITTING ON ITS SUSPENSION AND THAT'LL HELP US LATER DOWN THE ROAD WITH OUR FUTURE MOCK UP. 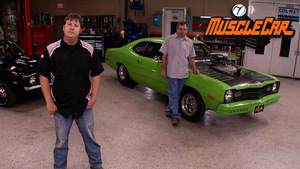 (ANNOUNCER)>> AFTER THE BREAK, RICK SHOWS YOU HOW TO MODERNIZE YOUR WINDOWS WITH A FLUSH MOUNTING TUTORIAL, AND TOMMY GETS RID OF SOME TIRED OLD DRIP RAILS WITH A LITTLE METAL WIZARDRY. BACK IN OUR OLDSMOBILE. WELL THE REASON IS WE'RE NOT GONNA PUT IT BACK IN IN THE STOCK LOCATION. IN FACT WE'RE SHAVING ALL THE ORIGINAL TRIM AND FLUSH MOUNTING THE FRONT AND REAR GLASS. SO I'M CLEANING IT UP TO GET IT IN PLACE AND START COMING UP WITH A GAME PLAN. NOW WHEN WE SET THIS STUFF IN PLACE AND START DESIGNING THE SHEET METAL AROUND IT, I'M GONNA BE TACKING THINGS, BENDING THINGS, AND PUSHING THINGS, AND I DON'T WANT TO SCRATCH THE GLASS UP. SO I'M COVERING IT UP WITH SOME TAPE AND SOME WELDING PAPER TO MAKE SURE CAUSE I DON'T WANT TO BE ON THE INTERNET TRYING TO FIND A BACK GLASS FOR A '69 OLDS. WE AREN'T GONNA NEED THESE GLASS RIVET KNOB THINGS ANY MORE. SO I'M CUTTING THEM ALL OFF WITH A CUTTING WHEEL. AND NEXT WE NEED TO MEASURE THE DEPTH OF THIS RECESS RIGHT HERE BECAUSE THAT'S GONNA TELL US HOW FAR UP WE NEED TO SPACE THE GLASS IN ORDER TO GET THE FACE OF THE GLASS FLUSH WITH THAT BODY LINE RIGHT THERE. SO SURVEY SAYS WE HAVE A TOTAL DEPTH OF THREE QUARTERS OF AN INCH. NOW WE'VE GOT A QUARTER OF AN INCH WORTH OF GLASS THICKNESS, SO THAT LEAVES US A HALF OF AN INCH THAT WE NEED TO SPACE THAT GLASS UP TO GET THE FRONT OF IT FLUSH. YEAH, WE'RE ABOUT ALMOST A SIXTEENTH OF AN INCH OVER. I'LL TRY REMOVING ONE PAINT STICK. JUST THREE AND I CAN MAKE UP THE REMAINDER OF THE SPACE WITH TAPE. THERE WE GO, NOW THAT'S ALMOST PERFECT RIGHT THERE. THESE PAINT STICKS WILL TAKE THE PLACE OF THE BLOCKS THAT WE'LL USE LATER ON TO SET OUR WINDOW AT THE PROPER HEIGHT. YOU CAN DO THE SAME THING WITH ALL KINDS OF STUFF YOU MIGHT HAVE LAYING AROUND IN THE GARAGE. LETS SEE HOW CLOSE WE ARE TO BEING FLUSH. WE'RE CLOSE BUT IT'S STILL GOT TO COME UP A LITTLE BIT MORE. A LITTLE BIT MORE OF SHIM. I'M JUST GONNA FOLD UP A LITTLE BIT OF TAPE HERE, RAISE THAT SHIM UP A LITTLE BIT. I DON'T NEED MUCH, WE'RE CLOSE. ONE MORE AGAIN, THERE WE GO, THAT'S LOOKING GOOD. WELL GUYS, ONCE IN A WHILE WHEN YOU'RE BUILDING CARS, YOUR LUCK IS THERE, AND THIS IS ONE OF THOSE INSTANCES. WE TOOK THE GLASS AND MOVED IT FURTHER UP. AND SINCE THIS WHOLE SHAPE OF THE GLASS AND THIS CHANNEL IS KINDA WEDGE, WHEN WE MOVED IT UP IT TIGHTENED UP OUR GAPS. CHECK THIS OUT. THE TRIM WE HAVE TO GO ALONG THAT EDGE THERE IS GONNA FILL IT IN WITH NO PROBLEM. ON THE DOWN SIDE, THAT LEFT US WITH A PRETTY GOOD SIZE GAP BETWEEN THE TRUNK LID AND THE BACK GLASS. IT'S NOT THAT BIG OF A DEAL. WHAT I'M GONNA DO IS RUN THE SAME TRIM ACROSS THE BOTTOM AND EXTEND THIS SHEET METAL UP. THAT WAY WHEN THE TRUNK IS CLOSED, IT'LL SEAL RIGHT UP AGAINST THAT RUBBER, NO PROBLEM. I'LL USE A PIECE OF SHEET METAL THAT I FOLDED LENGTH WISE TO START WITH AND A BODY HAMMER COMPLETES THE SHAPE. A CLEAN AND STRIP DISC WILL KNOCK THE PRIMER OFF THE EDGE OF THE DECK LID. USE A LITTLE MAGNET ON THE BOTTOM SIDE OF THAT AND THAT JUST MIGHT HELP ME GET ALL THIS STUFF LINED UP TO TACK IT. THEN I'LL MAKE A FEW SLICES ALONG THE EDGE SO I CAN MAKE THE METAL FOLD IN NICE AND SQUARE. THE REASON I DO THAT IS THAT WAY WHEN YOU'RE LOOKING AT THE SIDE OF THE TRUNK LID AND WHEN IT'S ALL BODY WORKED AND PAINTED, IT WON'T BE THICK AND THEN GOING INTO THIN AND THICK. IT'LL LOOK LIKE IT'S NEVER BEEN TOUCHED. I'VE GOT ONE MORE CUT TO MAKE. HAMMER THAT DOWN. NOW ONCE THAT GETS WELDED UP AND BODY WORKED IN, THAT'LL LOOK LIKE A FACTORY SEAM. DOING A FLUSH MOUNT LIKE THIS IS ONE OF THOSE LITTLE CUSTOM TOUCHES THAT SEPARATES A RESTO MOD FROM A RESTORATION. I THINK THAT WORKED OUT PRETTY GOOD. I HAD A FEW DIFFERENT IDEAS ON HOW TO DO IT, BUT I THINK THAT'S A PRETTY GOOD DECISION RIGHT THERE. I'VE STILL GOT A LITTLE BIT OF CLEAN UP STUFF UNDERNEATH, GET RID OF THE OLD TABS FOR THE STOCK TRIM. BUT OTHER THAN THAT I JUST NEED TO GET THIS THING OFF AND GET IT WELDED UP. 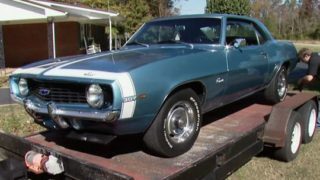 (ANNOUNCER)>> STICK AROUND AND TAKE A GANDER AT THIS PRISTINE PONTIAC. AND WHEN YOU'VE HAD ENOUGH OF THAT, LEARN HOW TO DITCH AN UNNEEDED EYE SORE THAT CAME STANDARD BACK IN THE DAY. A 1969 PONTIAC TRANS AM. 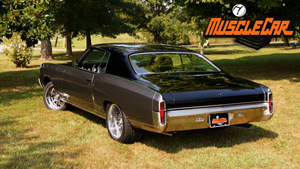 (RICK)>> WHILE FORD AND CHEVY WERE BUSY GETTING FAMOUS IN '69 FOR THE CAMAROS AND MUSTANGS, PONTIAC WAS DROPPING A BRAND NEW BOMB ON THE MUSCLE CAR MARKET. (RICK)>> TRANS AM WAS THE NAME AND ROAD RACING WAS THE GAME. NOW PONTIAC PULLED OUT ALL THE STOPS WHEN THEY ROLLED THESE BABIES OUT. FIVE BUCKS FROM EVERY SALE WENT TO THE SCCA TO COVER LICENSING FEES SO THEY COULD USE THE TRANS AM NAME. T/A RACING WAS HOT IN THE LATE '60'S AND EARLY '70'S. PONTIAC WAS A BIG PLAYER. IT'S NO WONDER THESE THINGS WERE SERIOUS CONTENDERS ON THE STREET. THEY WERE BUILT WITH ROAD RACING IN MIND. POLY GLASS WHITE WALLS. HEAVY DUTY SUSPENSION PARTS, FRONT AND REAR SWAY BARS ALONG WITH POWER DISC BRAKES AND STEERING HELPED THIS TRANS AM STAY BETWEEN THE LINES. NOW PONTIAC MAY HAVE CLAIMED ONLY 335 HORSEPOWER, BUT THE REAL HORSEPOWER NUMBERS ON THESE STREET FIGHTERS, WELL THEY WERE CLOSER TO 366. AND EITHER WAY, THEY COULD JUMP FROM ZERO TO 60 IN ABOUT SIX POINT FIVE SECONDS, AND TEAR UP A QUARTER MILE IN JUST A HAIR OVER 14. 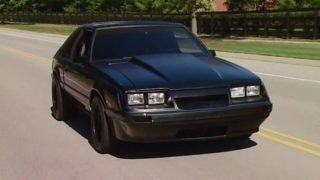 THESE FIRST TRANS AMS HAD LOOKS THAT COULD KILL, AND WITH THE FUNCTION TO BACK UP THE STYLE, THAT'S EXACTLY WHAT THEY DID TO THE COMPETITION. THE SCOOPS UP FRONT DO MORE THAN JUST SNARL AT ANY CHALLENGERS. THEY RAM AIR DOWN THE THROAT OF THE FOUR BARREL 400. 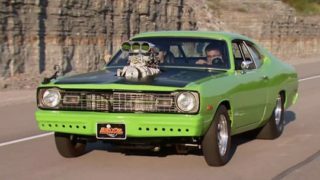 THE SCOOPS ON THE SIDES PULL HOT AIR OUT OF THE ENGINE COMPARTMENT, KEEPING EVERYTHING UNDER THE HOOD JUST AS COOL AS THE OUTSIDE. WITH BADGING TO BOOT, BODY LINES THAT MADE HISTORY, IT ALL ADDS UP TO A SWEET LITTLE TRANS AM. NOW UP FRONT A BLACKED OUT GRILL AND QUAD HEAD LIGHTS TAKE THE LEAD. RALLY STRIPES RUN FROM THE FRONT ALL THE WAY TO THE BACK WHERE THEY'RE MET WITH A FIBERGLASS SPOILER THAT'S CAPABLE OF 50 POUNDS OF DOWN FORCE AT 100 MILE AN HOUR. THE REAR VALENCE WAS PAINTED TO MATCH THE RALLY STRIPES, AND THE TAIL LIGHTS WERE LONG AND SLEEK MATCHING THE STANCE OF THE CAR. JUST A TOUCH OF CHROME ON THE FRONT AND REAR BUMPERS WAS ALL THE FLASH THESE CARS NEEDED. THE SOUND OF TIRES BEING RIPPED OFF THE RIMS DID THE REST OF THE TALKING. AND NOT MANY TRANS AMS WERE MADE WITH IVORY INTERIORS, AND THIS ONE'S JUST AS CLEAN AS THE DAY SHE ROLLED OFF THE ASSEMBLY LINE. WITH THE COMBINATION OF CUTTING EDGE STYLE, RACE DRIVEN TECHNOLOGY, AND VERY LOW PRODUCTION NUMBERS, THESE TRANS AMS ARE CONSIDERED TO BE ONE OF THE MOST DESIRABLE PONTIACS EVER BUILT. THE TRANS AM MAY BE GONE, BUT MUSCLE CAR WILL BE RIGHT BACK. (ANNOUNCER)>> GET OUT YOUR GRINDERS, WELDERS, AND SPACE SUIT? HOUSTON, WE MAY HAVE A PROBLEM. 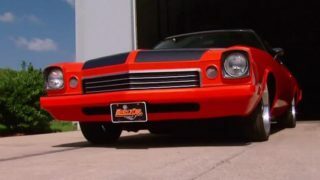 (TOMMY)>> HEY Y'ALL, YOU KNOW THE IDEA BEHIND THIS CAR'S TO HAVE A LOT OF CUSTOM TOUCHES. THIS CAN COME IN SEVERAL DIFFERENT FORMS FROM HUGE TO KIND OF SUBTLE. TODAY I'M GONNA SHOW YOU A MODIFICATION THAT CAN REALLY CLEAN UP THE LOOK OF YOUR CAR. WHAT WE'RE GONNA DO IS SHAVE OFF THE DRIP RAIL OF OUR OLDS. THIS IS GONNA GIVE US A REAL STREAM LINED LOOK. THE ONLY THING IS, IF YOU GET CAUGHT IN A RAIN STORM, YOU MAY WANT TO RIDE WITH THE WINDOWS UP BECAUSE ALL THAT WATER BLOWING IN MAY MESS UP YOUR HAIR, BUT I THINK WE'RE ALRIGHT. NOW SOMETIMES WITH DRIP RAIL SCREWS THEY GET ALL FULL OF SEALER AND GUNK. YOU CAN USE A HAMMER TO HIT THE BACK SIDE OF THE SCREW DRIVER. THIS HELPS PREVENT STRIPPING THE HEAD OF THE SCREW, WHICH USUALLY REQUIRES DRILLING IT OUT. ONE THING TO KEEP IN MIND WHILE YOU'RE CUTTING THE RAIL OFF IS THAT YOU WANT TO CUT ALONG WITH IT, KIND OF PARALLEL. YOU DON'T WANT TO GET THE BLADE CROOKED AND GOUGE INTO THE ROOF CAUSE THAT'D JUST BE A REPAIR YOU'D HAVE TO MAKE A LITTLE LATER. I KINDA FLIRTED WITH IT THERE, BUT WE'RE STILL ALRIGHT. I'M GONNA SCRAPE OUT ALL THIS OLD GLUE THAT THEY USED ON HERE CAUSE I JUST PLAIN DON'T WANT TO SMELL IT WHEN IT BURNS UP. NOW WE'RE READY TO GRIND THIS LIP FLUSH WITH THE ROOF SKIN. I LIKE TO USE A FLAP WHEEL CAUSE IT'S A LITTLE MORE FORGIVING. YOU COULD USE A ROCK, YOU JUST HAVE TO PAY A LITTLE MORE ATTENTION. PATIENCE IS A REAL VIRTUE HERE. IF YOU GET INTO A BIG HURRY, IT WON'T TAKE MUCH TO ACCIDENTALLY PUT A FEW NICE SIZE GOUGES INTO YOUR ROOF. TIME TO WELD THE TWO PANELS TOGETHER. NOT DOING THIS AND JUST SPREADING FILLER OVER THE TOP OF IT WILL CAUSE IT TO BUST, AND THAT'S NOT WHAT YOU WANT TO DO CAUSE THAT WOULD BE CALLED DOING BAD WORK. SO DON'T EVEN THINK ABOUT IT. WE'RE READY TO START THE FRONT HALF. AND YOU MAY BE WONDERING WHY I'VE GOT THIS FANCY GET UP ON. WELL IT'S CAUSE THE BODY HAS SOME LEAD ON IT AND WE'VE GOTTA REMOVE IT. YOU DON'T WANT TO RUN THE RISK OF CONTAMINATING YOUR CLOTHES. JUST THINK ABOUT YOUR YOUNGUNS. WE USE AN AIR GRINDER TO PREP THE SURFACE FOR WELDING, BUT THERE COULD STILL BE A LITTLE BIT OF LEAD LEFT IN THERE. SO I'M GONNA KEEP MY SPACE SUIT ON JUST A BIT LONGER. OUR ROOF PANEL HAS A FACTORY STAMPED STYLE LINE, AND OUR APILLAR ONLY HAS A PINCH WELD OF TWO PIECES OF METAL. SO I'VE GOT TO ADD SOME FILL ROD TO HELP IT LOOK A LITTLE MORE CONSISTENT. WHAT I'M GONNA USE IS A PIECE OF THREESIXTEENTHS ROUND STOCK. AND WITH IT TACKED INTO PLACE, I'LL KNOCK EVERYTHING NICE AND FLAT. WHEN I GROUND THIS DOWN FLUSH, I ELIMINATED MOST OF THE ORIGINAL PINCH WELD. I NEED TO SOW THIS BACK TOGETHER SO AS I'M BURNING IN THE ROD, I'M GONNA MAKE MY WELDS RUN OVER TOP OF BOTH PIECES OF METAL, WHICH WILL FUSE THEM ALL BACK TOGETHER. A FEW MORE GOOD PASSES WITH A GRINDER WILL KNOCK OFF ALL THE UGLY STUFF. YOU CAN TAKE THIS BAD BOY AND TIE A BOW ON IT. WHOLE LOT BETTER LOOK THAN WHAT WE STARTED WITH. 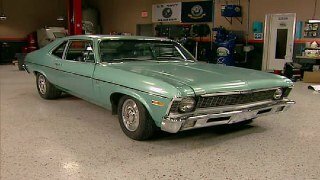 AND THIS IS JUST ONE OF THE BOAT LOAD OF MODS THAT WE'VE GOT PLANNED FOR THIS CAR. SO YOU GUYS KEEP YOUR EYES PEELED. IF YOU HAVE ANY QUESTIONS ABOUT WHAT YOU'VE SEEN ON TODAY'S SHOW, CHECK OUT POWERBLOCK TV DOT COM. BUT AS FOR NOW WE'RE ALL OUT OF TIME. SO UNTIL NEXT WEEK, Y'ALL KEEP IT BETWEEN THE DITCHES.